GOOGLE Glass may have a rival in the "awkward-looking" wearable tech stakes. US-based Hushme has created what it calls the "world's first voice mask for mobile phones." And it looks utterly ridiculous. The mask, which comes in a few different colours, can be worn around the neck as a standard wireless headphone or in masking mode, which lets the user block out the sounds of their conversation. When in masking mode, the headphones come with an app that let the user add a masking sound to further muffle the conversation. The sounds include R2D2, Darth Vader, wind, rain and a host of others, according to the company's website. Oh yes, there it is. The headphones appear geared to office workers, who talk on the phone all day or are looking to have private conversations at their desk. 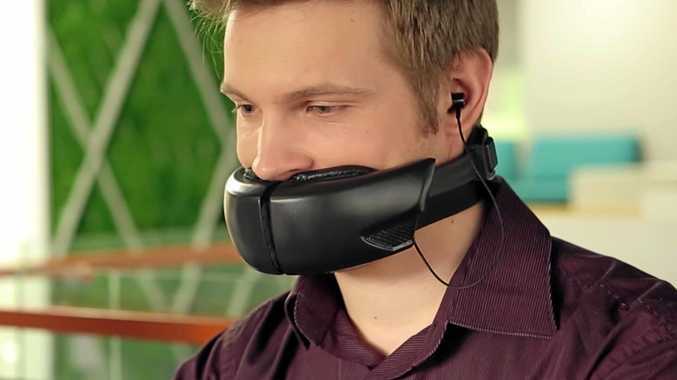 The mask uses magnets to snap in front of your mouth, while still allowing the user to take a phone call. Hushme is said to be working on a crowd-funding campaign later this year to build the products, at a cost of less than $US200.